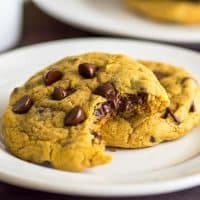 These Small-batch Chocolate Chip Pumpkin Cookies are soft and chewy with plenty of pumpkin spice flavor, like the perfect chocolate chip cookie all dressed up for fall. Looking for more small-batch pumpkin desserts? Try these Small-batch Apple Pie Bars, Mini Pumpkin Pie with Graham Cracker Crust, and Apple Crumb Muffins. We are officially into fall now, and I’ve already shared a bunch of pumpkin recipes on the site this year, Cinnamon Sugar Pumpkin Donuts, Small-batch Pumpkin Cupcakes, and a Mini Pumpkin Cake, but I haven’t yet shared any pumpkin recipes with one of my favorite flavor combos, pumpkin and chocolate! So today, I’m fixing that. 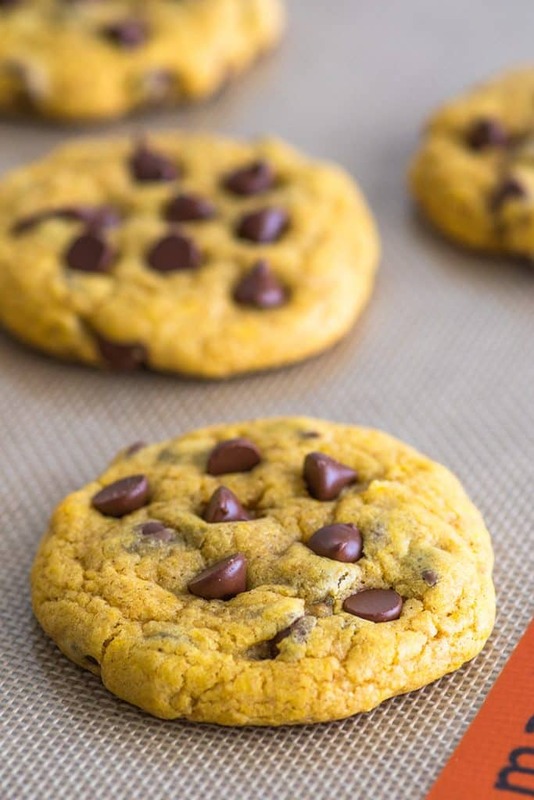 Let’s all bake some Small-batch Chocolate Chip Pumpkin Cookies! Biting into one of these cookies is like biting into the perfect chocolate chip cookie all dressed up for fall. They use just enough pumpkin to give them pumpkin flavor with a soft, slightly chewy texture. 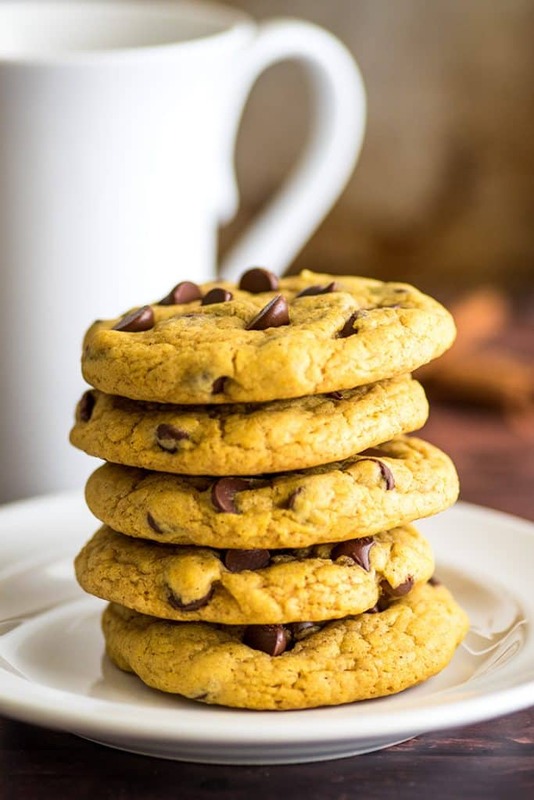 And since these are pumpkin cookies and it’s pretty much law that pumpkin desserts must use pumpkin spice, they are packed full of fall flavors like cinnamon, nutmeg, and cloves to go along with the more-than-generous share of chocolate chips mixed in. 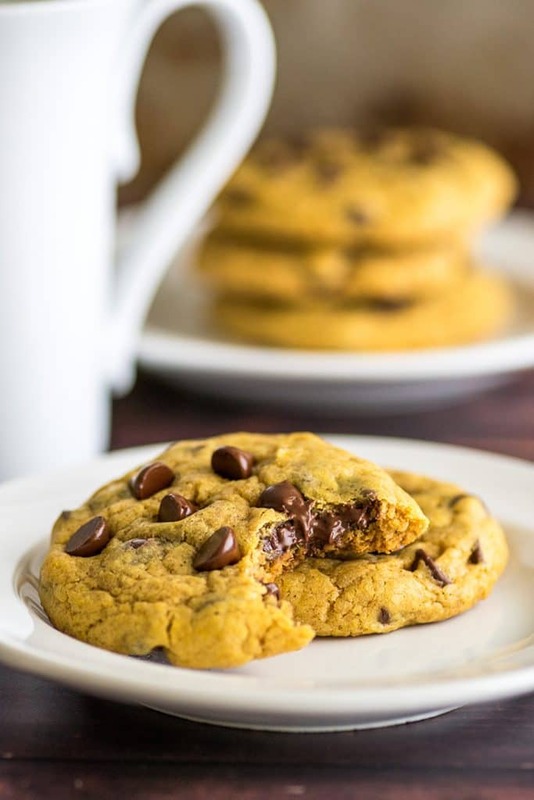 Like my Instant Gratification Small-batch Chocolate Chip Cookies, these Chocolate Chip Pumpkin Cookies use melted butter, and the super short chilling time is optional, so you can make them whenever the whim strikes you and be eating them in about 20 minutes. Plus, since this is a small-batch recipe (it makes 5 nicely sized cookies), you have just enough to share without having to worry about loads of leftovers. Not a bad way to say hello to fall, if you ask me. In a small, microwave-safe bowl, microwave butter for 20 to 30 seconds until melted. Set aside to cool slightly. In a small bowl, whisk together flour, baking soda, salt, cinnamon, ginger, cloves, nutmeg, and allspice. Once your oven is preheated and batter slightly chilled, drop 5 rounded spoonfuls onto your prepared baking sheet. For prettier cookies, roll dough into balls and gently flatten dough balls to 1/2 inch on the baking sheet with the palm of your hand. Bake for 9 to 12 minutes until cookies look set and the bottoms are lightly browned. 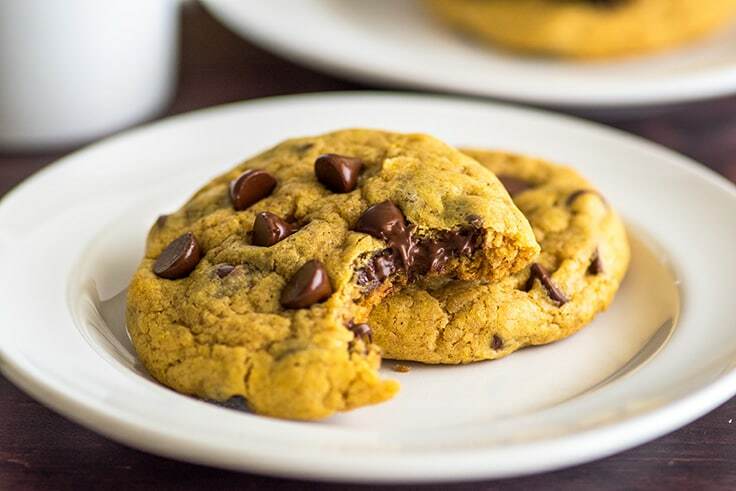 Press a couple extra chocolate chips into the top of each cookie if you want them to look extra cute. Cool on the cookie sheet and enjoy! *You can replace all the spices (not the salt) with 1/2 teaspoon of pumpkin spice. *Chilling time is totally optional, but I think the slightly chilled dough gives you a prettier cookie. Have some leftover pumpkin puree? Check out my post, What to do With Leftover Pumpkin Puree for some ideas to use up the leftovers! There’s too much liquid in the recipe if you include the white as well. It also changes the texture of the cookies. Omg, first of all, I just want to say that I am obsessed with your small batch recipes!! I made three types of cookies out of this recipe!! I made white chocolate chip pumpkin cookies, pumpkin snickerdoodles and gluten free pumpkin dark chocolate chip cookies!! They turned out soooooo good!!! Everyone loved them! Thank you so much!!! 😀 Also, your muffin recipes are the BEST I have ever tried. They are better than store-bought muffins. I had been exhausted of trying Pinterest recipes and failing each year but not anymore~! I am so happy to have found your blog. Please continue making more! They were so good! I just doubled everything and used a whole egg. They were amazing, I love the hint of all spice. Thanks, Rebecca! I’m so glad you enjoyed them!